Panerai watches combine Italian design with Swiss watchmaking art. The timepieces' distinctive look is famous worldwide. Models with a tourbillon and minute repeater are the highlights of these haute horlogerie watches. Those who wear a Panerai on their wrist, calls attention to themselves with the watch's unique design. These impressive, large watches are descendants of models from the 1930s and 1950s. During this time, Panerai supplied the Italian Marines with their diving instruments. The crown protection on Luminor models is particularly striking. When closed, the frame around the crown presses down against it, securing it against the case and making it water resistant. Actor Sylvester Stallone purchased a Slytech, a special Luminor series, for shooting the film Daylight. Arnold Schwarzenegger, action hero and the Terminator, is also a fan of this Italian brand. He wore a Luminor Marina in the film Eraser. The Radiomir comes without any crown protection. The watch was Panerai's first and it has been part of their product palette since 1936. Officine Panerai – the company's full name – originally developed the watch for the Italian military. The 47-mm case brings the Rolex Oyster to mind, as the Panerai was based on this watch. The 1940 and 1950 series pay homage to each respective decade and consist of retro watches with specific design characteristics. Panerai also offers chronographs, GMT watches, manual watches, and automatic watches, as well as complicated models with a tourbillon. One watchmaking highlight is the Radiomir 1940 Minute Repeater Carillon Tourbillon GMT Oro Rosso with a GMT function, tourbillon, and minute repeater. Which movements does Panerai use? Since 2005, Panerai has belonged to a select group of Swiss watch manufacturers that produce their own calibers. They had previously used calibers from other companies for their watches. Most were from the manufacturer ETA, part of the Swatch Group. The caliber Valjoux 7750 (without a chronograph function) and the manual caliber Unitas 6497 were frequently used. Today, Panerai produces a multitude of their own movements. Their repertoire includes simple manual calibers, chronograph calibers, and complicated movements with tourbillons and minute repeaters. Panerai's specialties are movements with long-lasting power reserves ; some lasting up to 10 days. Their first in-house caliber was the P.2002, which they presented in 2005. Their production facility has been located in the Swiss town of Neuchâtel since 2002. How much do Panerai watches cost? Prices for Panerai watches range from a few thousand to hundreds of thousands of euros. One of the most expensive models is the 18-karat red gold Panerai Radiomir 1940 Minute Repeater Carillon Tourbillon GMT. Thanks to its skeletonized in-house caliber P.2005/MR, you can view the tourbillon from both the front and back sides. The highlight of this model is its minute repeater, which you start with a push-piece at 8 o'clock. Three tiny hammers chime the hours, 10-minute intervals, and the individual minutes. If you want to enjoy this melodious watch, be prepared to spend over 300,000 euros. You can purchase the Lo Scienziato - Luminor 1950 Tourbillon GMT for around 115,000 euros. This skeletonized watch is available in titanium or ceramic (without a minute repeater). 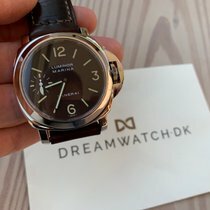 If you're looking for an affordable entry into the world of Panerai watches, then the Luminor Base Logo Acciaio or the Radiomir Black Seal Logo Acciaio are good choices. Both cost around 3,500 euros new. The Luminor is, without a doubt, one of the most famous watches in the world. Its distinctive crown-protecting bridge is its main, distinctive feature. Most versions have a case diameter of 44 mm, making these diving watches the perfect fit for a larger wrist. Standard versions are known as the Luminor Base Logo Acciaio and have only two hands to display the hour and minutes. New, they cost around 3,500 euros. Top Luminor Marina models made of 18-karat red gold with an 8-day power reserve (192 hours) cost around 15,000 euros new. 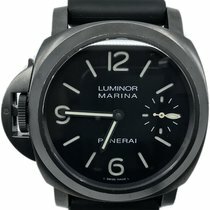 You can purchase a new stainless steel Luminor Marina for much less, around 3,800 euros. If you want a model that runs for longer than a week before needing to be wound again, you should be prepared to spend around 4,700 euros for the 8-day version. The diving watch version is available new for around 5,500 euros. You can purchase a pre-owned Luminor, such as a Base or Marina, for around 3,200 euros. Gold variants cost around 13,000 euros, while limited editions can cost over 20,000 euros. 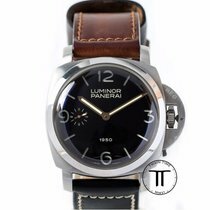 Panerai Luminors have the advantage that they maintain their value over the years. Watches from the Panerai Luminor 1950 collection were inspired by vintage watches that Panerai made for the combat divers of the Italian Marines in the mid-20th century. The watch that most closely resembles the original version is reference number PAM00372. It features a 47-mm stainless steel case, crown-protecting bridge, and a so-called sandwich dial. A sandwich dial is made up of two discs set on top of each other. The bottom disc contains luminous material while the upper disc has corresponding cutouts for the numerals and indices. This large timepiece is most suitable for bigger wrists, and its aged, dark brown calf leather strap emphasizes its retro design. You can purchase new models with reference number PAM00372 for around 6,300 euros, while the prices for pre-owned models start at around 5,300 euros. One of the introductory models in this collection is the 44-mm Luminor Marina 1950 3 Days Automatic Acciaio (PAM00351). You can buy pre-owned models for less than 5,000 euros, while new versions cost about 5,700 euros. Highlights of this series are intricate flyback or double chronographs. Regatta chronographs, which have a countdown function, are also available. The Luminor 1950 Regatta 3 Days Chrono Flyback Automatic Titanio (PAM00526) was made for yachtsmen and costs around 12,000 euros new. Pre-owned models are rare, seeing as the watch is still a relatively new model. The Luminor Submersible 1950 3 Days Automatic Bronzo (PAM00382) is especially treasured by collectors. The bronze watch was introduced in 2011 as a limited edition with a run of 1,000 pieces. Within a very short time, the value of the watch had significantly increased. You should be prepared to spend around 30,000 euros on a pre-owned watch in good condition. This also applies to the watch's successor (PAM00507), which was introduced two years later. Panerai released the third version of this bronze watch in 2017, again limiting it to 1,000 pieces. Thus, it's quite likely that the value of this diving watch will increase quickly over the next few months. Panerai introduced the first Radiomir watches to the market in 1936. The timepieces were originally meant for the Marines. The design of current models is heavily reminiscent of the originals; they both have large cases ranging between 45 and 47 mm. Above all, the Radiomir California 3 Days Acciaio (PAM00424) is a homage to the 1930s timepieces. The "California" in its name refers to its so-called California dial, which uses Roman numerals as hour markers on the top half and Arabic numerals on the bottom half. It also features a cushion-shaped case, an unprotected cone-shaped crown, and thin wire loop strap attachments. The Radiomir California is available for 4,800 euros pre-owned in very good condition; new, this retro watch costs around 5,400 euros. The 45-mm Radiomir Black Seal is a bit more affordable, costing only 3,500 euros pre-owned and 4,000 euros new. 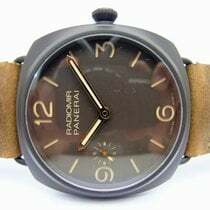 Panerai revised the Radiomir's case in the 1940s. Its predecessor's cushion-shaped case, as well as the thin wire loop strap attachments, were old news. The new version was 47 mm in diameter and had horn-shaped lugs for improved stability. The sandwich dial featured four Arabic numerals at 12, three, six, and nine o'clock. Panerai used stick indices for the remainder of the hour markers. The current models in the Radiomir 1940 collection are reminiscent of diving watches from the 1940s. The case diameter ranges from 42 to 47 mm. The smallest versions are suitable as women's watches, especially those made of 18-karat red gold. One such model is the Radiomir 1940 Oro Rosso (PAM00513), which costs about 12,000 euros new. The 45-mm gold version (PAM00573), as well as the 47-mm gold version (PAM00515), are more suitable for men. Both cost around 16,000 euros. One highlight of this collection is the Radiomir 1940 10 Days GMT Automatic Oro Rosso, which features a GMT function, automatic movement, power reserve, date display, and 24-hour display. Like its name suggests, the watch has enough energy to last 10 days after it's fully wound. You can purchase this timepiece for around 32,000 euros on Chrono24. The history of Panerai began in 1860, when Giovanni Panerai opened a small watchmaking workshop and school in Florence, Italy. However, because all original documents from this time were destroyed in a flood in 1966, it's difficult to reconstruct the company's exact history. What is known for sure, however, is that the company's sign bore the words Orologeria Svizzera (Swiss watchmaking) at the beginning of the 20th century. Initially, the company focused on importing and selling Swiss watches from companies such as Jaeger-LeCoultre, Ulysse Nardin, Vacheron Constantin, and Rolex. In order to keep import taxes as low as possible, the watches were delivered as individual pieces. Once the components reached the workshop, they were reassembled and adjusted by professionals who had trained at Panerai's watchmaking school. The brand's customers included prominent, rich Florentines as well as the Italian royal family. The Italian military has belonged to Panerai's clientele since 1910, and initially, they delivered pocket chronographs. Between 1910 and 1914, Panerai worked on developing fluorescent devices together with Lieutenant Carlo Ronconi. Since the new luminous material was radium-based, it also glowed in the dark. The term Radiomir first appeared in 1916 on a French registered patent. The word is a combination of the Italian words radio (radium) and mira (sight). In the years following, Panerai delivered compasses, barometers, bathometers, underwater lamps, and other instruments to the Italian military. Over the course of the 1940s, Panerai developed an unmistakable mark of their brand that remains iconic today: the half-moon crown-protecting bridge. This distinctive type of crown protection is still featured on today's Luminor models. The luminous material Luminor, made from tritium, was brand new at the end of the 1940s and replaced the radioactive material Radiomir. Large and distinctive timepieces define the luxury watch manufacturer Panerai. Consistent designs and their crown-protecting bridge create a steadfast image that every watch enthusiast recognizes at first glance. The watches impress with their functionality and easy-to-read dials. They were inspired by the demands of the military and more recently, action stars such as Sylvester Stallone and Arnold Schwarzenegger have helped the watches achieve cult status. The company received new financial resources after joining the Richemont Group in 1997. Thanks to these funds, doors were opened to new marketing and technological development possibilities that led to Panerai's first in-house calibers. Today, the Radiomir and Luminor models are no longer pure military watches: They're beloved by city dwellers, creative minds, star cooks, and managers of all kinds.